Had a really fun day today. Good weather and some fun courses, before finally setting into my hotel in St. Charles, Illinois, in preparation for tomorrow’s Illinois Association for Health, Physical Education, Recreation and Dance annual conference. View from the Hole 7 tee at Lions Park in Harvard, Illinois. My day started in “Hah-vahd,” also known as Harvard, Illinois. A truly fun nine-hole course at Lions Park, with a little bit of everything off the tee. Easily my favorite nine-hole course on this trip! Short holes, long holes, elevation changes, trees. 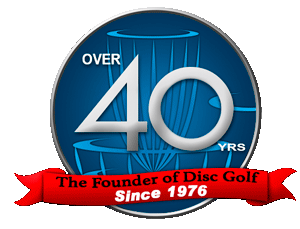 A great course at which to hone any number of skills throwing discs. 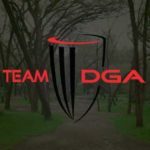 Adam Schultz designed that course back in 2009, and I will just say kudos to Adam for creating a fun place for locals to enjoy! After enjoying Lions Park, I was met with what was easily the worst course I have played on this trip: Raintree Park in Woodstock, Illinois. Tee signs were missing, but that is forgivable. What was not forgivable was how difficult it was to know where to throw on Hole 4. Where to find the Hole 7 tee. How Holes 4, 5, 6, 8 and 9 are being poorly maintained, with the Hole 5 basket being entirely smashed and bent to no longer function as a basket. How one needs to worry about two neighboring dogs on Holes 4-6, wondering if you are going to be attacked or bitten. 🙁 I played that course as quickly as I possibly could, then left…covered in thousands of clinging seeds from weeds that were as tall as my shoulders. The opposite of a fun experience. View from the Hole 18 tee at Lippold Park in Crystal Lake, Illinois. 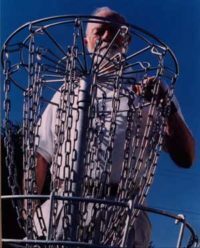 After Woodstock, I snuck in a fun eighteen holes at Lippold Park in Crystal Lake, Illinois. One or two holes were still wet/muddy after what I assume must have been some heavy recent rains and mild flooding. But I enjoyed Lippold a lot, and had my best tee shot of the day. Putting my drive on Hole One two inches off the pole for the easy drop-in deuce. View from the Hole 18 tee at Judson University in Elgin, Illinois. After Lippold Park, it was on to Judson University to spend a little time catching up with a friend of mine from my undergraduate college days. 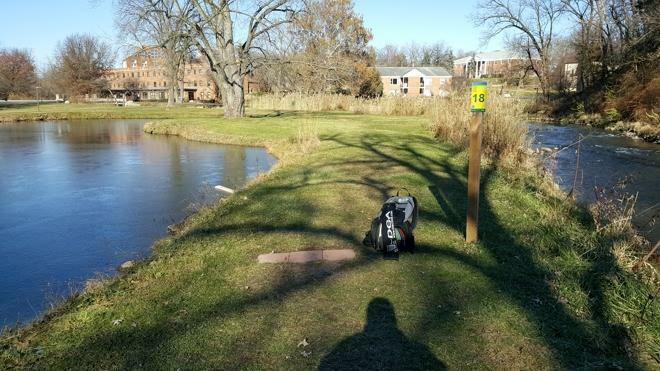 My friend teaches Math, Physics and Astronomy for the institution, so I got the grand tour of his academic building, followed by a quick 18 holes on their campus course (to check out the tee signs we at DGA designed for them). Judson’s course was very short, but very technical! A few of the holes under 200-225 feet were so technical, in fact, that I did not even want to try and get my deuces on those holes! I didn’t like how several of the holes ran extremely close to walking paths and roads, as careless disc golfers could hit pedestrians and/or vehicles with errant throws. But I did have fun. View from the Hole 2 tee at Sunny Hill Park in Streamwood, Illinois. After Judson, I snuck in a quick nine holes at Sunny Hill Park in Streamwood, then made my way down to St. Charles to check into my hotel and prep for the conference. However, I got into my hotel a little earlier than I had planned, so I decided to head down to Geneva to squeeze in eighteen more holes of disc golf at The Links of Wheeler Park before sunset. View from the Hole 11 tee at The Links at Wheeler Park in Geneva, Illinois. The Links at Wheeler Park was a great way to end my day, as it was my kind of course. Numerous trees, though not a lot of places to lose plastic. 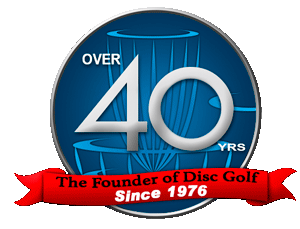 A well-groomed park, with plenty of chances to throw a variety of different discs and shots over the course of the round. I don’t think I will have a chance to play any more courses before I return home to Minnesota…as between weather, limited daylight, and needing to get back in time for another event, the planets are aligning against me. That said, getting eleven new courses played over the past two days feels like a great accomplishment.